Never judge on first appearance – and so my opinion on sea lions changed dramatically when I got to see them up close. 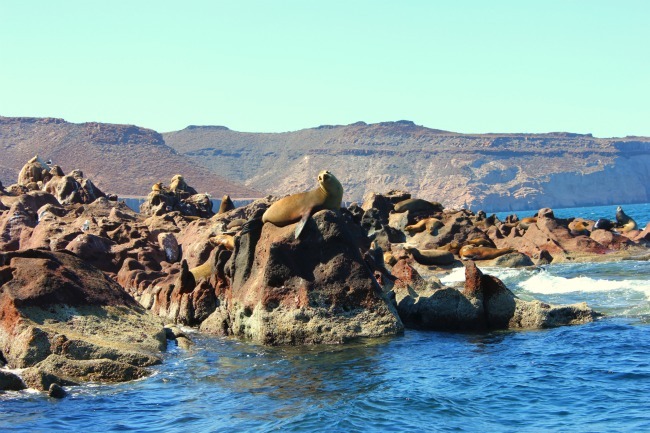 Off the Baja coast in the Sea of Cortes, a guided tour can take you to the protected marine zone, once named the aquarium of the world by marine explorer Jacques Cousteau. And if you’re willing, you can go snorkeling and swimming with sea lions in the wild. this is the place for you. After a lengthy boat ride, it was time to put on a wet suit and get into the cold water – although part of the Pacific Ocean, this far off-shore the water is not warm. A small islet is the home of the local sea lions, amazing creatures who seem like their only view of world is to be perched on a rock and just watch it go by. The older ones are huge, reminding me of the creature in Star Wars who takes Princess Leia captive, while the younger ones are smaller, but there’s still something about these creatures that look like they’re not comfortable with moving. That’s until they decide to go into the sea, where they become sleek and fast-moving – and even elegant creatures. And as I was mesmerized by their movements for as long as the guide would let us, I am still in awe of such amazing animals – and will never forget the playfulness towards one another, and when they would come very close to me, and then quickly turn away, almost laughing at me.